The Q-switched Nd: YAG is the most frequently used laser for tattoo removal. 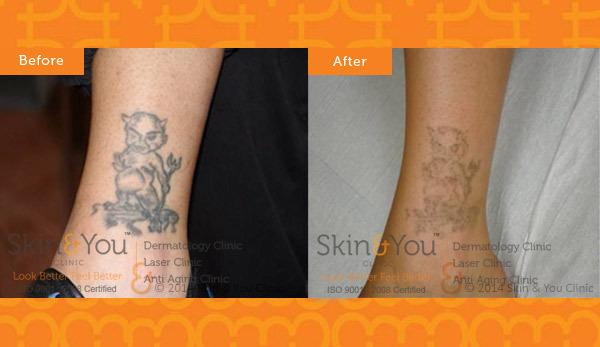 During treatment, pulses of light from the laser are directed onto the tattoo, breaking up the tattoo pigment. Over the next several weeks the body’s cells remove the ink of the tattoo from the skin. With the Q switched ND YAG laser available on the Harmony laser system you can effectively treat dark tattoo inks, specifically black (which accounts for more than half of all tattoos), blue and green. Patients should expect to come back for several treatments to achieve expected results. Tattoos have become a very popular way of adorning our bodies and expressing ourselves. Often chosen in the spur of the moment, we later come to regret our chosen design. An unwanted tattoo can cause psychological and emotional distress and difficulty in social and work environments. The procedure is suited for tatoo that cannot be removed by laser. E-raze tattoo removal utilises a specially designed inorganic chemical remover, applied in the same method as the original tattoo. It is designed to draw the tattoo pigment out of the skin, removing the unwanted tattoo. The treatment is substantially less painful than other removal methods and frequently more effective than laser removal options. It is can be used on professional or home made tattoos and permanent make-up. Number of treatments may vary depending on your individual circumstances and condition of original tattoo. A body tattoo can be removed on average in around 4-8 treatments, while permanent makeup can usually be removed in 2-3 treatments. Treatments e are spaced at 8-12 week intervals and larger tattoos may have to be divided into sections for subsequent treatment. Why Skin & You Clinic for Tattoo Removal? At Skin & You Clinic we have the best technology partners called alma lasers with the best hands on experience onthe system to provide you with effective tattoo clearance with no possible side effects.